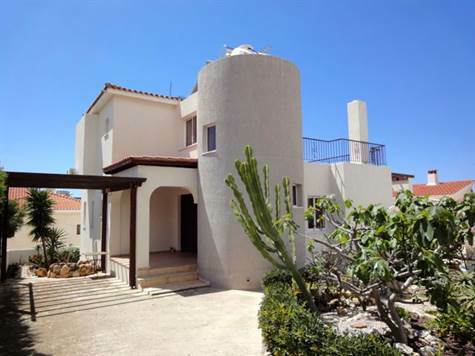 Tala, Paphos - This spacious 3 bedroom detached villa with superb sea views is located in Lofos Tala, one of the most sought after residential neighbourhoods within easy reach of Paphos and the International School. The ground floor features a spacious living room with feature fireplace. Patio windows open on to a wide veranda and entertainment area with outdoor kitchen. A decorative archway separates the living room from the fully fitted kitchen/diner which has light coloured units, modern appliances and easy access to the outside veranda via patio doors. A hallway off the entrance foyer leads to a double size bedroom and shower room and a further two double bedrooms and family size bathroom are located on the first floor. The stunning sea and mountain views can best be enjoyed from the large balcony on the first floor, accessed via a bedroom and directly from the landing. The property is in very good condition and is suitable as a permanent residence or as a holiday home. Furniture can be included if required and there are full title deeds.